Book Trumps is an exciting and innovative new reading challenge from Swansea Libraries which has been running at Killay Library since December of last year. Aimed at 4-12 year olds, children are able to collect 30 fantastic playing cards by just reading books. As well as encouraging reading, the cards also assist in reading development by providing recommended reading based on the genre of each card. 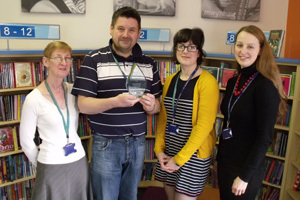 Swansea Council were awarded Third Place out of the Public Libraries in the competition. A quite complex campaign that required a good deal of creative material and pre-planning. However, the campaign also shows an understanding of the target audience – in this case children and their interest in collecting. The successful use of partners (schools) to develop user ‘buy in’ was well executed and the use of endorsements by celebs and head teachers is a great marketing ploy (and in this case probably achieved buy in from parents as opposed to the children). There was a clear team effort here and it was welcomed to see their consideration of copyright before embarking on execution.